It’s one of the coldest days of the year in Cambodia, and Sovanna Chhon is not wearing a jacket. His younger brother Bung Learng is. And there’s a reason why. Even in this tropical southeast Asian country, the cool season brings crisp temperatures. And it’s not that Sovanna is used to the cold—he is obviously uncomfortable as he shivers in his short-sleeved shirt. But Bung is sick, and he needs the family’s only adult-size jacket the most. Sovanna is a decade older than Bung, which means that although they were not close growing up, he has always looked out for his little brother. 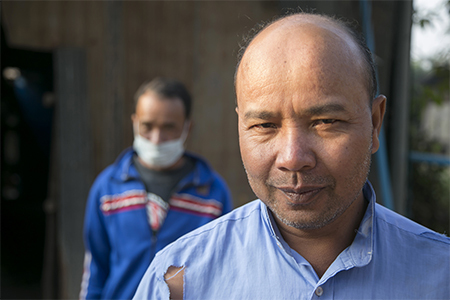 When Bung contracted tuberculosis, he lost weight and energy, and could no longer work to support himself. At his sickest, he weighed 108 pounds and could not get out of bed. Tuberculosis treatment requires taking medicine every day for 6 months, and works best when coupled with nutritious food. Sovanna, his wife Neoum and their son Sovanak live 90 miles from Bung’s home province of Pursat, but they were the only people who could help Bung comply with treatment. Bung’s medicine is free through the government, but there are gaps in service provision and accessibility. Catholic Relief Services, with support from the Global Fund, is working with the ministry of health to ensure people get tested for tuberculosis. If someone tests positive, CRS also helps that patient receive support to complete, first-line treatment. That means faithfully taking 3 pills per day for 6 months. Failing to keep to this regimen can lead to drug resistance, which requires a switch to daily injections at a distant health clinic. Like many others, Bung needed that accountability to get well, and his big brother stepped in to help. For his treatment, Bung moved in with Sovanna and Neoum, a family already living on the margins. Their only income was the $4 a day they earned cleaning onions for a merchant. Just buying the ingredients to cook a meal for 4 people costs $2, so getting Bung healthy enough to work was critical to make ends meet. Sovanna has supported him every step of the way in his recovery. He watches Bung take his medicine each morning and records it. He accompanies Bung to weekly appointments at the clinic, where he receives a week’s worth of medicine and a checkup. Neoum, despite a physical disability that limits her mobility, cooks nutritious food that has helped Bung gain 10 pounds in his first 3 months. And now, not only is Bung feeling better, but he is also well enough to work with his family cleaning onions, bringing their daily wage up to $6. Higher wages mean that while the family continues to struggle to pay for expenses, there is more money to buy food and pay for Sovanak’s school supplies. Still, even in the early days of treatment, before Bung could contribute, there was no question Sovanna would help. That sense of responsibility continues, even as Bung grows stronger. It means Sovanna will give his jacket to Bung. He will do everything he can to help. CRS and our partners in the ministry of health will provide support, too, even if that means helping when it’s not expected. At the end of our visit with the brothers, just as our car pulled away, our driver discreetly gave Sovanna his own jacket.